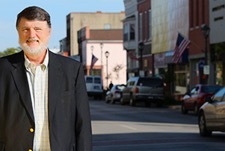 In Boom Town USA: The 7½ Keys to Big Success in Small Towns, author Jack Schultz captures the creative, innovative and timeless methods used to re-energize and re-invent communities, and position those areas toward a clearer path to economic, social and cultural success. The prescription is inspirational, very readable, and filled with common sense suggestions to help communities succeed. Locate Finger Lakes Initiative fully ascribes to this prescription for the future economic success of our region. We are inspired by the work of Jack Schultz, and are encouraging all our friends and partners to work together to follow this path. Locate Finger Lakes encourages all to follow the 7 1/2 Keys described in Boom Town USA, and help our communities meet the economic challenges of today. Jack Schultz’s work as the CEO of Agracel, Inc., a firm that specializes in industrial development in small towns, led him to ponder the roots of rural prosperity. In 2000, a journey began that started as a curiosity, became a thesis, and resulted in a passion. That passion, to know what makes America’s hometowns tick, the result of more than three years of research, led to the creation of Boom Town USA: The 7½ Keys to Big Success in Small Towns. In it, Schultz attempts to answer a perennial question: What separates the thriving towns from the struggling ones? Boom Town clearly has struck a nerve. The book is in its fourth printing, and Schultz has traveled thousands of miles since it published giving nearly 400 presentations to hometowns across America, helping them realize their greatest potential. He has since retired from the speaking tour, but his book is still available, and continues to be highly recommended to communities as a guide on how to become a Boom Town.